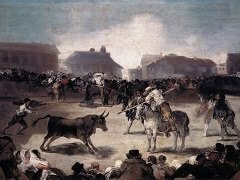 Goya painted Fight With Cudgels during Ferdinand VII's reign. 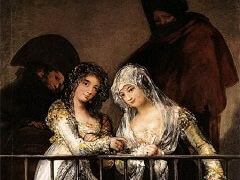 Goya was a Francophile and he had liberal ideas. 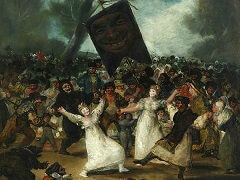 When Goya made this painting the liberals were fighting against the absolutists. The painting shows a countryside scene, where two men are striking one another with cudgels. 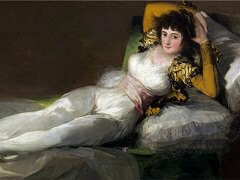 We can see the transparency and clarity of the color by the degradation of the painting. We can't see the men´s complete legs. The legs seem to be buried in high grass or in mud. 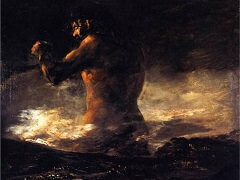 Goya didn't paint this: the 'burial' was made in the restoration of the painting by Martínez Cubells. The man on the left is stronger and his face is spotted with blood. His opponent has the left arm raised to protect his face. Both are wearing the typical clothes of that time. In the background we can see the countryside in different ochre and reddish tonalities. 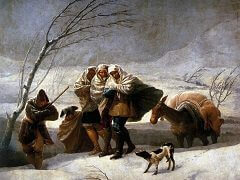 The picture seems to be an allusion to the Spanish civil wars. 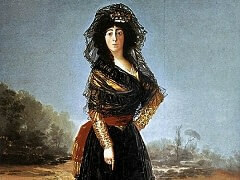 Copyright © 2011-Present www.FranciscoGoya.com. All Rights Reserved.